It's a simple fact that The Doors have become one of those bands that have endured over the passing decades, with new fans joining the fold every year. Maybe it's the mystique of the late Jim Morrison, whose passing at 27 left the music world wanting more. The Doors are rock and roll giants, and Morrison's induction into the "27 Club," alongside fellow deceased rockers and peers like Jimi Hendrix and Janis Joplin, has only grown their legend over time. Because of this, The Doors are no stranger to compilation albums and greatest hits packages, which seem to be a dime a dozen. Their core couple of dozen hits are well known and respected, and for good reason. But this new release from Rhino Entertainment offers something new. Specifically, this is not a greatest hits package; rather, it's a collection of all the singles that the band released over their lifetime--as in 45 rpm record singles--complete with both the A and B sides of that single. This is fantastic because some of those B-sides (I count three) never appeared on any of their original Elektra albums. Furthermore, many of the A-sides are notable themselves for two reasons. The first, and perhaps most important, is that the singles were released in the late sixties and early seventies with radio play in mind. The uncut versions of the songs that exist on so many of the full-length albums would never have fit on a 45 record and weren't designed with radio play in mind. The mentality of radio stations and music companies at the time dictated that songs should be under three minutes, allowing for more music to be played per block. For an example, let's look at the song "Light My Fire" from the band's 1967 debut. That song, as it exists on the album, is over seven minutes long (7:06, specifically), which is too long for a radio single. It has lengthy organ and guitar solos, which were cut for the radio version, bringing the single edit of the song down to 2:52. That single version is what is represented on this album, and the track that follows it is the B-side to that single, "The Crystal Ship." The other notable thing about this collection is that these single mixes are different from the album mixes. That distinction may not appeal to a casual listener, but if you're into The Doors, that's a big deal because it means that these songs sound different. Whereas the album mixes of some of these songs rise and fall in volume and offer a more nuanced experience (because The Doors were, if anything, very much about creating an experience), the single mixes are blasts of sixties rock perfection. They were meant to punch the listener and grab their attention, and they come out of the gate at full blast. As a coincidence of this last reason, there are a handful of mono mixes (every track here is represented in stereo) offered as a bonus at the end of the compilation. This provides a glimpse into how these songs sounded when they debut on A.M. radio fifty years ago this year. They sound amazing, and the mastering done on these mixes is fantastic. As for the specifics of the package, the collection contains 44 tracks spread across two CDs. 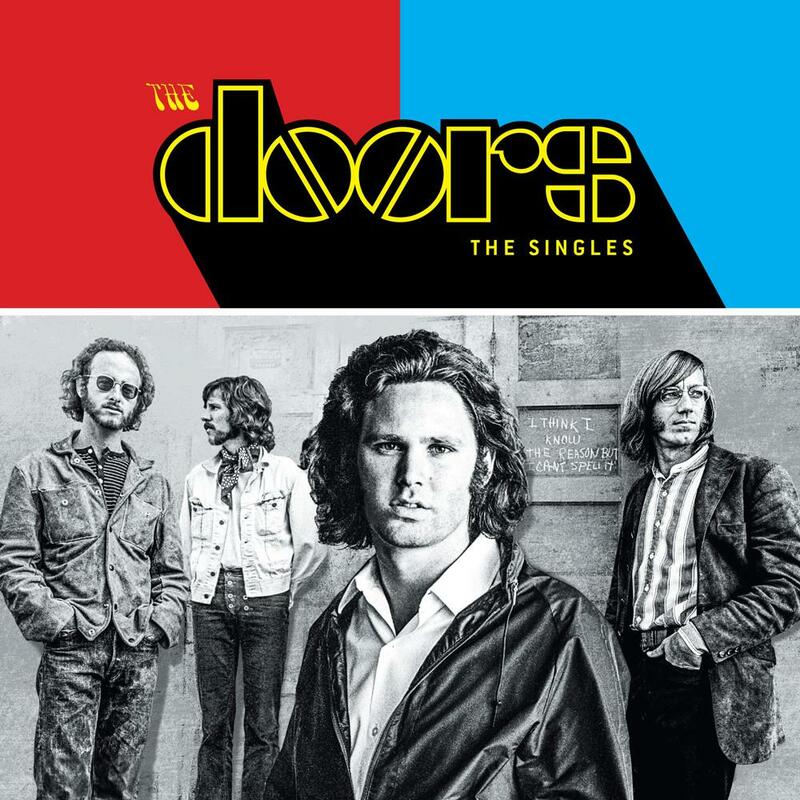 The first disc covers all the singles and B-sides released while Jim Morrison was still alive, while the second disc offers the post-Morrison Doors singles that were released during the band's seventies years. This compilation even covers the singles from the controversial An American Prayer album in which the surviving Doors recorded music over Jim Morrison's reading of his poetry, as well as from their 1983 live album, Alive, She Cried, which itself was culled from earlier performances. Add in the mono mixes as a supplement and you've got an exhaustive and complete chronology of the band's United States singles releases with every accompanying B-side. The package itself is pretty minimal; there's no booklet or essays, simply a brief description of what date each single was issued and what album it came from. there are multiple versions of this set available. 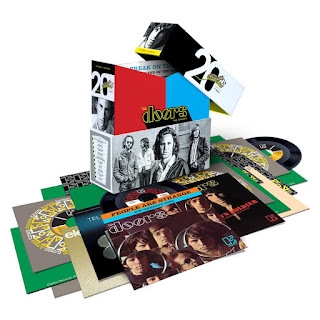 There's a two-CD set, a deluxe version that includes a bonus Blu-ray audio disc featuring 1973's The Best of the Doors in high-definition audio. Finally, there is a vinyl box set version that features reproductions of every 45 rpm record as it was issued, plus a bonus poster of the covers from singles issued all over the world. at 150 dollars US, the vinyl edition is an appealing set for fans and collectors. It's rare that a compilation like this actually offers something both for new and old fans alike, but The Singles manages to do exactly that. For newcomers eager to dip their toe into the waters, the package is a terrific introduction to the raw power and energy of The Doors. For older fans who have seen and heard it all, this collection introduces mono mixes not heard in decades and single mixes that are different from the albums, plus a few rarities that had become hard to find. By putting all of this in one place, it's hard not to give this double-CD set the highest recommendation possible. You can purchase the set on Amazon HERE.